So… you are traveling to India in monsoon. You are lucky to experience the natural best of India during monsoons. Where to capture the monsoon beauty of the country – waterfalls, hill stations or heritage sites? We would say, flower markets. Whichever capital city you are in, visit the flower market where the bounty of nature is merchandise for sale, early in the morning. You may have several options to spend nights out. 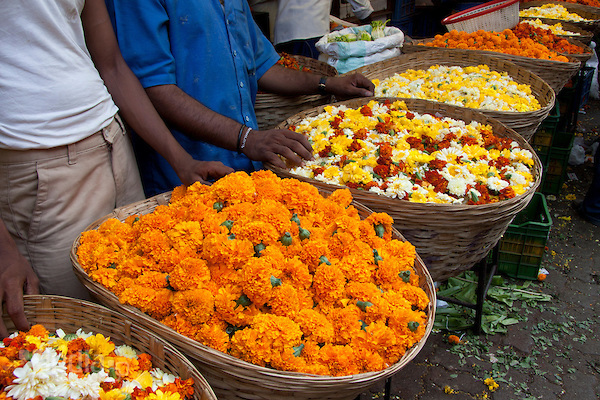 A visit to the flower markets in India is the best thing to do on monsoon mornings. 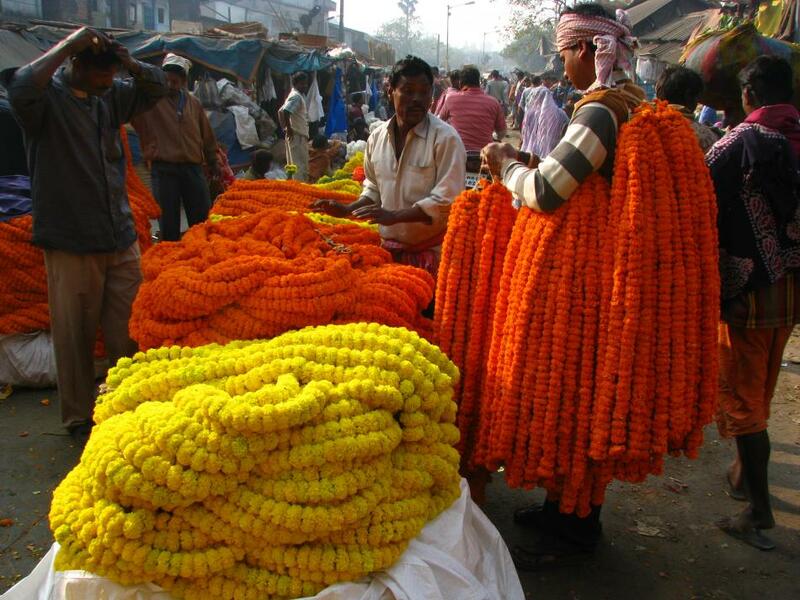 Indian Eagle shares some tidbits of seven flower markets in India to make you understand “Why”. 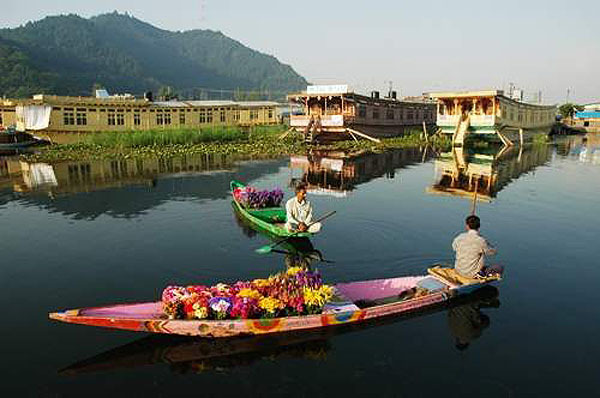 The floating flower market on Dal Lake in Kashmir is an eye-catching picture of beauty in bloom. The boats with heaps of flowers sailing on the lake make it a photographic site. In the morning, Dal Lake remains calm only to have its silence broken by the movement of boats. When the soft rays of the morning sun fall on the lake, the flowers gleam with bright hues. Mullik Ghat under the iconic Howrah Bridge is a bustling flower market on the Ganga River in Kolkata. Because of its riverside location, it is a photographers’ delight for tourists in the city. 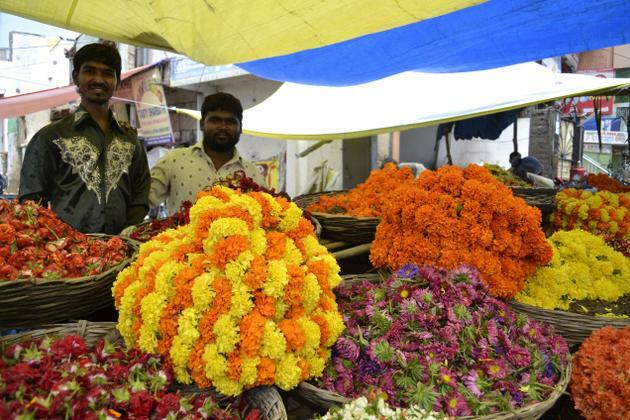 Of the flower varieties for sale, orange and yellow marigolds add to the colorfulness of Mullik Ghat. This Kolkata flower market supplies flowers to the city, the suburban areas and the districts of the state. On the festive days of Durga Puja, Kali Puja, Laxmi Puja and Saraswati Puja, the market is at work for 24 hours. It springs into activity during the wee hours of the morning. 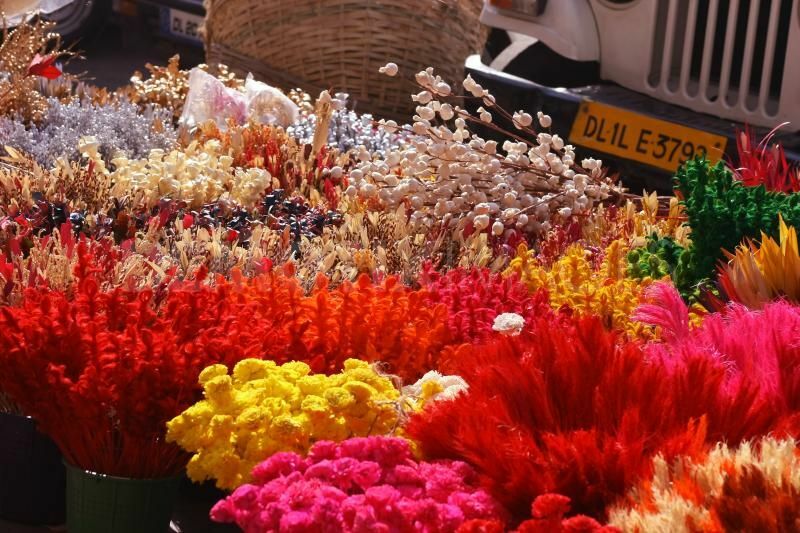 Visit to the flower market or phool mandi, as popularly known as, is one of the things to do in Delhi. If you derive sensual pleasure from fragrance and color, visit the Delhi flower market at Ghazipur to please your senses, early in the morning. Connaught Place, Mehrauli and Fateh Puri were the locations of the flower market before it is shifted to Ghazipur. Close to the metro station – Ashok Nagar – the phool mandi is a wholesaler of flowers like rose, orchid, lotus, lily, helconia and others. One of the busiest and most colorful parts of Mumbai, Dadra flower market blooms like buds at dawn. The market is a labyrinth of 600 stalls selling multiple varieties of flowers in cane baskets. The beauty of roses and the fragrance of jasmine are what is the most fascinating about Dadra flower market. The hours from 4am to 9am is the prime time to see heaps of flowers, feel the intensity of fragrance and catch the fast tempo of life here. In monsoon, the flower market of Dadra is a must visit for photographers. What comes to your mind when you think of Madurai? Of course, it is temples. Madurai is popularly known as a temple town in the Indian state of Tamil Nadu. The Meenakshi Temple is one of the best tourist attractions of Madurai. 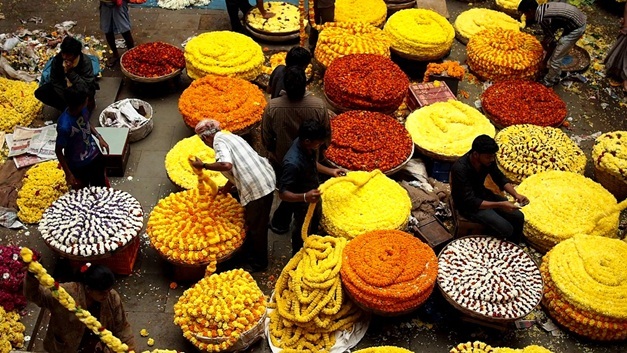 Often ignored by tourists, the flower market is a less-known place in this South Indian city. If the Meenakshi Temple is an amazing architecture, the flower market is a wonderful collage of colors. The huge variety of flowers in the flower market is an eye-catching visual. In Madurai flower market, rose and jasmine sell like hotcake. Jasmine is known as Madurai Malli here. Gudimalkapur and Jambagh are wholesale flower markets in the city of Hyderabad. The markets are as wonderful as the beauty of the city itself. Hyderabad has been in love with bright hues of flowers since the era of Nizams. It is a pleasure to catch a smile on the rosy cheeks of flower sellers in the morning. The markets supply flowers to retailers and local bazaars. White and red flowers are prominent colors in the palette of Gudimalkapur and Jambagh markets. 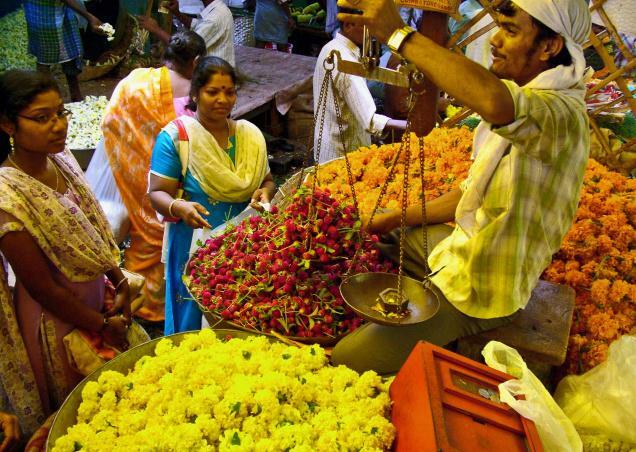 If you take a walk across Bengaluru city for a breath of fresh air in the morning, make sure to visit the flower market. Located in the area between Jama Masjid and Avenue Road, the market is a regular happening with a very short time that is from 4am to 7am. The flower sellers of all age groups sit or stand with their colorful merchandise on one side of the road from Jama Masjid to Avenue Road. The fragrance of flowers lies heavy in the air of the market. This is a great theme and the coverage is so good! Hi Indrani! Nice to see your kind words in appreciation of our article! Please be advised to explore our portal for many interesting stories from India and USA. Happy reading!